Chute Square	Located near historic St Anthony Main, Chute Square is home to the Ard Godfrey House, the oldest remaining wood frame home in the Twin Cities. 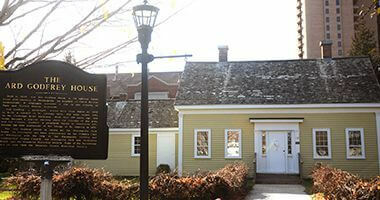 While we own the historic Ard Godfrey House, the renovation and operation of the house has been a volunteer project of The Woman’s Club of Minneapolis since 1976. Volunteers in 1850’s clothing provide tours on summer weekend afternoons. See the Godfrey children’s walnut cradle, an original Chickering rosewood piano and many more authentic furnishings and household items. Name: The park was named for Richard Chute in October of 1904. Chute was an early settler of St. Anthony who owned considerable land there and is credited with devising the street naming and house numbering systems of the city. His brother, Samuel Chute, was a commissioner on the first park board and developed the motto “Health and Beauty” for the park board. William Folwell reportedly suggested the motto to Chute. Some of the land purchased for Richard Chute Square was bought from the Chute brothers. The board first decided to purchase the park on November 2, 1903, but only after park commissioners asked representatives of property owners in the neighborhood to provide assurances that they were willing to pay assessments to cover the cost of the purchase. When those assurances were provided the board agreed to purchase the park for $18,775 to be paid over three years. Not only did residents of the neighborhood agree to pay assessments for the acquisition, but the East Side Improvement Association provided $1,000 to grade the lot and plant grass and trees. The idea of locating the house of Ard Godfrey in the square was first proposed—and rejected—in 1905. But in October 1908 the park board changed its decision, over the objections of some members of the St. Anthony Commercial Club, and gave permission to move the house to the square. 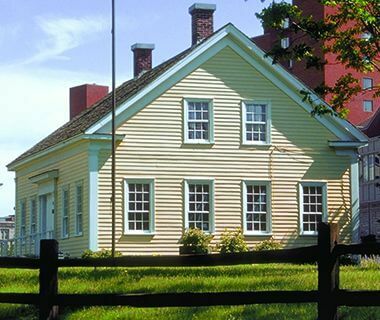 The house, originally built in 1848, was moved by the Hennepin County Territorial Pioneers Association, which also refurbished the exterior of the house to make it “presentable.” The association was given permission to improve the house and convert it into a public museum in 1914. In 1941, Theodore Wirth, then park superintendent emeritus, proposed that the park board trade Richard Chute Square for a portion of the old Exposition Building site along the river that had then been acquired by the Coca Cola Company. The suggestion was never acted upon. When the Hennepin County Historical Society proposed in 1955 to build a museum on the square, the board denied the request because there wasn’t enough space. The Godfrey House was extensively restored by the Woman’s Club of Minneapolis in 1975 and was opened to public tours in 1979. 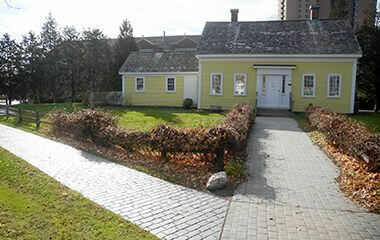 A replica of the house’s kitchen wing, which had collapsed in 1908, was opened in 1985. 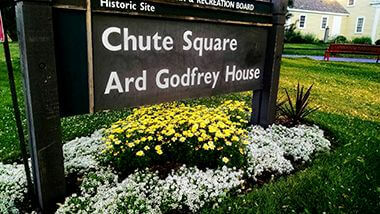 The most prominent feature in Chute Square is historic Ard Godfrey House. Enjoy a scenic stroll along Chute Square's paved walking trails.